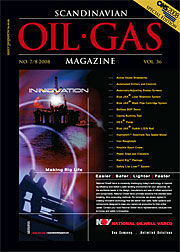 Welcome to this year’s special ONS edition of Scandinavian Oil-Gas Magazine. It’s not that this issue is bigger than ever before, we’ve managed to bring in more prominent individuals, who truly make a difference in activities in the North Sea, as well as others who are shaping the industry in their part of the world. All from the perspective of the national authorities as well as the viewpoints of important industry leaders. We start across the Atlantic, with an exclusive interview with Brazil’s Mines and Energy Minister Edison Lobão, focusing on Brazil’s massive pre-salt oil and gas discoveries, successful ethanol and biofuels programmes. Brazil stands of the threshold of becoming an oil and gas powerhouse, and Mr. Lobão will play an important role in the transformation. Closer to home, we have a fascinating interview with MP Malcolm Wicks, who has just completed the first year of his second appointment as UK Minister of State for Energy. Mr. Wicks describes the current status of oil and gas activities on the UK Continental Shelf (UKCS) and explains his Department’s role in ensuring energy security for the UK – a task he calls “a double challenge”. On the Norway side of the North Sea, we spoke with Liv Monica Stubholt, State Secretary in the Norwegian Ministry of Petroleum and Energy, about her role in a ministry that sits in the middle of environmental issues, rising oil prices, and a turbulent political period with three changes at the top level in the last two years. Ms. Stubholt shared with us her broad, deep knowledge of energy matter here in Norway. An absorbing must read. In addition to the energy angle for North Sea activities, we also have an interview with the Norwegian Minister of the Environment and International Development, Erik Solheim, who carries the dual responsibility for rigorously carrying out domestic environmental policies as well as overseeing involvement in international development. In the interview Mr. Solheim fills us in on the full spectrum of his Department’s efforts to practice environmental protection with a global perspective. Part of the Norwegian Government’s commitment oil and gas activities is support for research and development. One aspect of this is funding for pure research and incubation of marketable innovation, which is carried out by PETROMAKS – one of the large programmes within the Research Council of Norway. We med with Programme Co-ordinator Siri Helle Friedemann, who explained the process an introduced us to some of the success stories. Look for PETROMAKS at the ONS Innovation Park, where they are a co-sponsor. From the industry side, we have a glimpse into Brazil’s giant state-controlled oil company Petrobras, which plans to start a long-term production test at Santos basin pre-salt Tupi field in early 2009. To find out more we’ve interviewed Petrobras E&P Director Guilherme Estrella, who fills us in on some of the plans for the development. Thinking Barents Sea, Shtokman and beyond, we also have interviews with officials from Total and StatoilHydro CEO Helge Lund. Transport of all that gas will be a challenge, so we asked Permitting Director for Nord Stream AG, Dirk von Ameln to explain how the project is progressing. What else? We have pipelines and subsea development, licensing rounds and financial analysis, carbon issues and deepwater solutions, biodiesel breakthroughs and offshore wind. And the list goes on…. At the heart of it all is a preview of ONS – so be sure to have a great show, and if you have anything you’d like to tell the world, let us know.